Easy Cod Recipe in Buttery Wine Sauce. Cod fillets seasoned and pan cooked in a butter wine sauce. 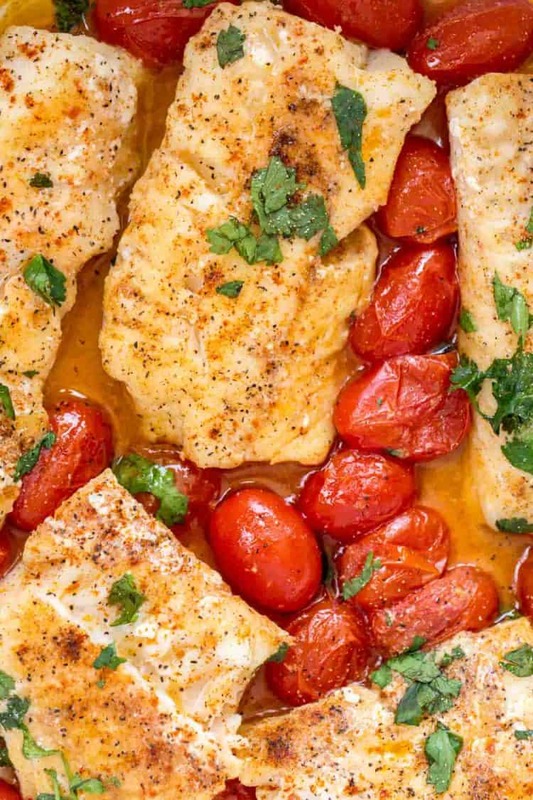 The easy tomato sauce enhances the flavor resulting in flaky, juicy and oh so tender cod fish (and just as delicious as our Buttered Cod in Skillet). We love the combination of butter with seafood, just look at the flavors it gives salmon and shrimp – so good! White cod fish is a great fish to cook with when you’re in a hurry and need dinner quick. Cod fillets require little seasoning but result in a great fish recipe. Cod fish is mild in flavor and the fillets are lean meat and when smothered in the butter sauce, create an unforgettable taste. The perfect choice for a light and healthy meal. This cod recipe is spectacular and ready in 15 minutes when cooked in a skillet. 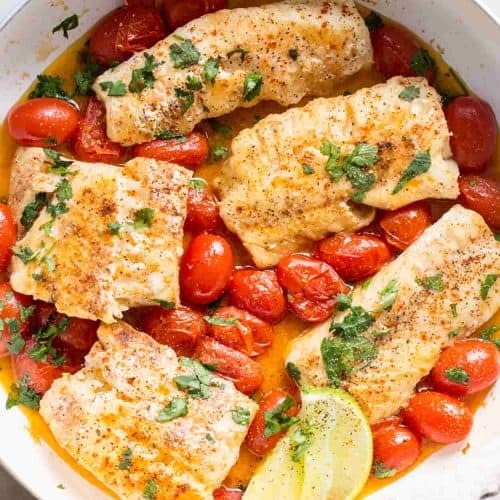 The cod fillets are seasoned then cooked in a tomato butter wine sauce and topped with fresh herbs. The tomatoes burst and release juices that compliment the already delicious wine and butter sauce. Preparing cod fillets in a skillet is really quick and you want to make sure everything is measured out and prepped. The fish is completely ready in 15 minutes, so have the table set and your side ready to be served. This homemade seasoning for fish is a favorite of ours. It brings out the flavors in the rather mild cod and enhances its natural taste. Combine the cumin, paprika, garlic, chili and salt and pepper. Generously coat all sides of the cod, set aside. 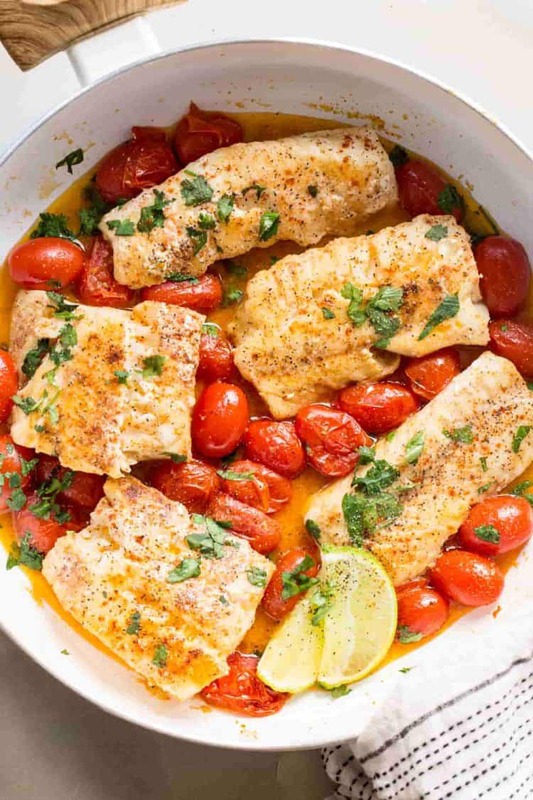 In a skillet, add the cherry tomatoes with the wine, chicken broth and cook until tomatoes start to burst, about 4-5 minutes. Pour the sauce generously over the cod before serving and top with herbs. Seafood is great to cook with, we try to serve seafood once a week in our home. We always try to create recipes that even our kiddos will approve of. Flounder with Vegetables Recipe– one skillet wonder. Bang Bang Shrimp– Bonefish copycat recipe for fried shrimp. Blackened Tilapia Recipe– so quick to make. Creamy Vegetable Tilapia– an unforgettable casserole. can I use frozen cod fillets? No, cod cooks really quickly and the fillets need to be thawed or they won’t cook through and you’ll have raw meat in the center. Completely thaw frozen fish in the refrigerator before preparing the fish. what kind of wine do I use? Use any dry white wine for this recipe, I used an inexpensive Chardonnay with great results. how can I bake this cod recipe in the oven? This cod fish is wonderful when baked in the oven. To prepare cod in the oven, season the fillets and place in a baking dish. Prepare the wine sauce per instruction and pour over the cod. Cover casserole with foil and bake 12-14 minutes, depending on the thickness of the fillets. In a small bowl, combine all the ingredients for the seasoning. Combine the salt, pepper, cumin, paprika, garlic and chili powder. Season cod on all sides. In a skillet, over med heat, add the broth, wine and cherry tomatoes, cook 5 minutes or until tomatoes start to burst and release juices. Add butter, cook until butter melts, stirring the sauce. Pour sauce over cod. Add fresh chopped herbs and serve. 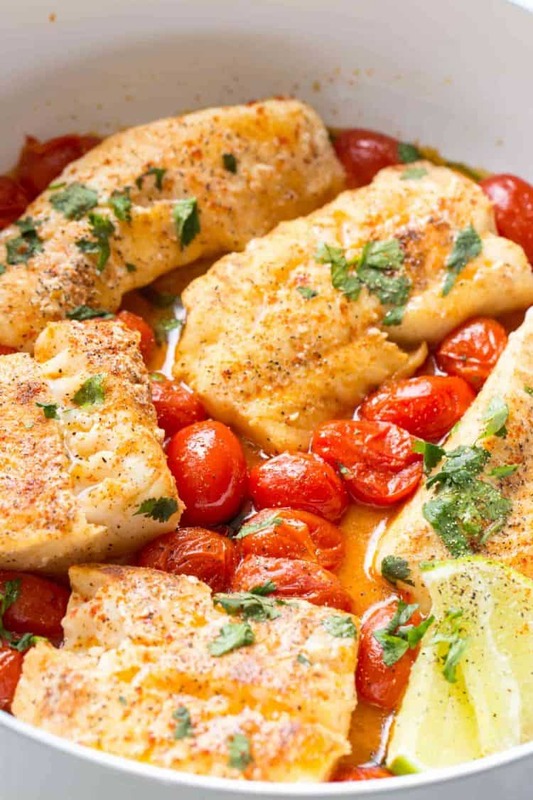 Cod is my favorite fish, and I loved the tomato butter sauce in this recipe. I agree, there’s just something about cod that is wonderful. Especially when it’s such an easy recipe. Loved the cod with the cherry tomatoes! It turned out great! Thanks for sharing the review on our cod, Steph. That’s wonderful. Going to make this for date night this week! This was so good! Really tasty! Perfect for weeknights! Thank you Toni! This codfish is perfect for a quick dinner! I absolutely love this butter wine sauce! Thank you! Kelly, I am glad you enjoyed this Cod recipe and the sauce!